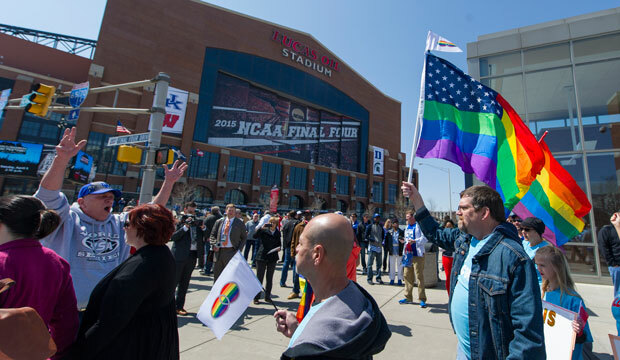 Despite historic progress on marriage equality over the past decade, lesbian, gay, bisexual, and transgender, or LGBT, individuals still lack basic, enumerated protections from discrimination in employment, housing, public accommodations, credit access, social and civic participation, and government-funded programs in a majority of states and at the federal level. In 2014, Sen. Jeff Merkley (D-OR) announced his intention to introduce legislation that would provide comprehensive nondiscrimination protections for LGBT people and their families in several areas of life, from the workplace to the public marketplace. A new poll by Generation Progress, the youth engagement arm of the Center for American Progress, shows wide support among America’s Millennials—defined as individuals between ages 18 and 34—for federal, comprehensive LGBT nondiscrimination legislation. Such legislation would provide protections for LGBT people in employment, housing, and other areas of life. Research conducted by Hart Research Associates for Generation Progress analyzed Millennials’ attitudes on the economy and governance. The research, “America’s Millennials: Still Looking for Change,” surveyed 900 Millennial adults nationwide in December 2014. Millennials were defined as adults ages 18 to 34 at the time of the survey. All questions were conducted online among panels maintained by YouGov, a leading online research firm. Additionally, slight weights were applied based on Census data in order to ensure an accurate demographic representation of Millennial adults in the United States. One of the survey questions asked participants to rate their support for passing laws that protect LGBT people from discrimination in employment, housing, and other areas of life on a scale from 0 to 10. A 0 is interpreted as no support for nondiscrimination legislation, 6 or higher is interpreted as support, and a rating of 8 or higher is interpreted as strong support. The poll found that 65 percent of Millennials—a key demographic in American elections—support comprehensive nondiscrimination protections, including 50 percent of Millennials who strongly support such legislation. Among other major political issues, comprehensive LGBT nondiscrimination protections received the highest level of strong support (as indicated by a rating of 8 or higher on a 0-to-10 scale) among all non-youth-specific issues from the general Millennial population. Among Millennial voters who supported President Barack Obama in 2012, comprehensive LGBT nondiscrimination protections maintained the highest level of strong support among all issues polled, including those related to education issues. Seventy-one percent of those voters strongly supported nondiscrimination legislation, with overall support reaching 85 percent. Finally, among Millennials who voted in 2012 but not in 2014—a key voting bloc that progressives need to turn out in order to win key 2016 races—overall support for LGBT nondiscrimination protections exceeds 70 percent. 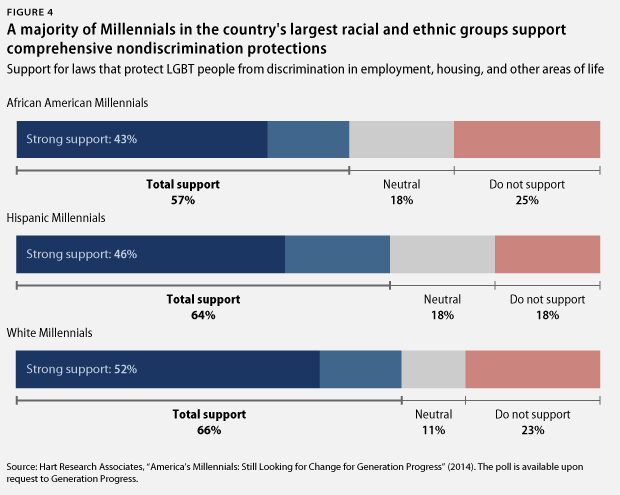 Millennial support for LGBT nondiscrimination legislation that covers employment, housing, and other areas of life reaches across racial and geographic lines. Majorities of African American Millennials, white Millennials, and Hispanic Millennials—the three largest racial and ethnic identities in the United States—support comprehensive protections. According to the Generation Progress poll, 57 percent of African American Millennials, 64 percent of Hispanic Millennials, and 66 percent of white Millennials—a swing demographic group that voted for President Obama in 2008, former Gov. Mitt Romney (R) in the 2012 presidential election, and Republicans in the 2014 midterms—support comprehensive protections. 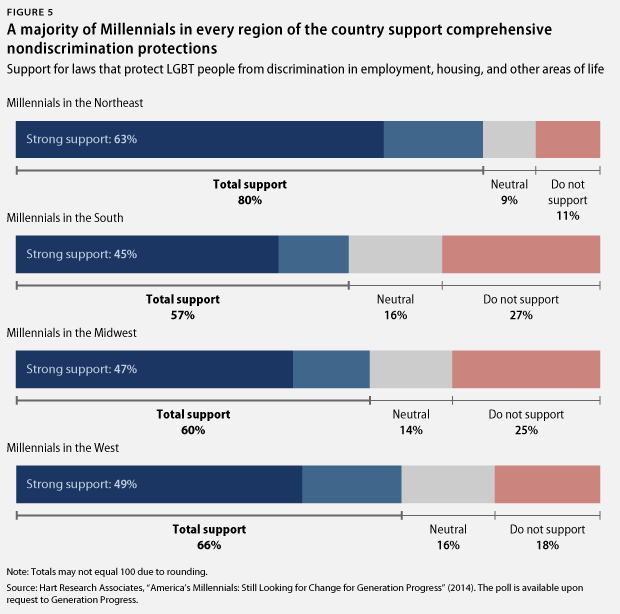 Millennials in every region of the country support LGBT nondiscrimination protections, including 80 percent of Millennials in the Northeast; 66 percent of Millennials in the West; 66 percent of Millennials in the Midwest; and 57 percent of Millennials in the South. 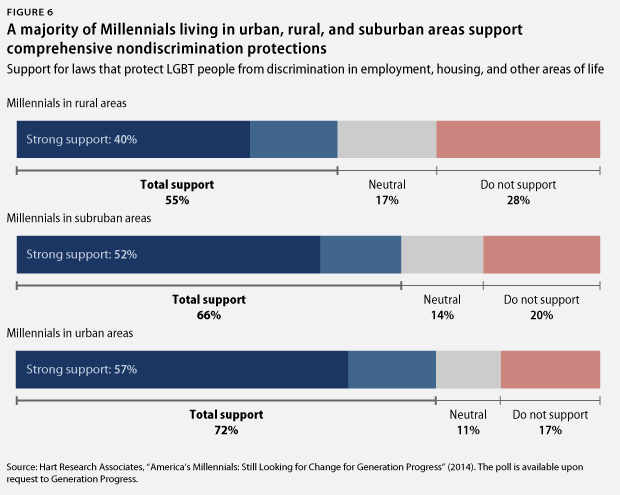 These trends continue across urban, suburban, and rural and small-town Millennials: 55 percent of rural and small-town Millennials, 66 percent of suburban Millennials, and 72 percent of urban Millennials support comprehensive LGBT nondiscrimination legislation. 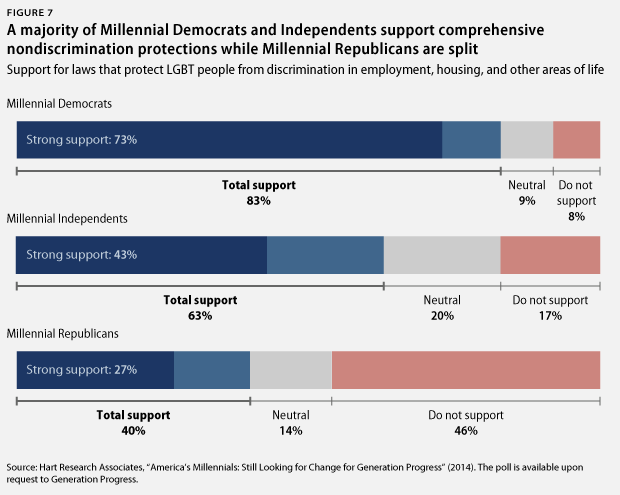 Finally, comprehensive LGBT nondiscrimination protections are overwhelmingly supported by both Millennial independents and Millennial Democrats, who support such protections at 63 percent and 83 percent, respectively. Seventy-three percent of Millennial Democrats and 43 percent of Millennial independents strongly support comprehensive LGBT protections. Republican Millennials were split on this issue, with 40 percent in support and only 46 percent opposed; 14 percent of them were neutral. Notably, more than one in four Republican Millennials—27 percent—strongly support LGBT nondiscrimination laws. Sarah McBride is a Research Associate for LGBT Progress at the Center for American Progress. Zenén Jaimes Pérez is the Senior Policy Analyst for Generation Progress at the Center.